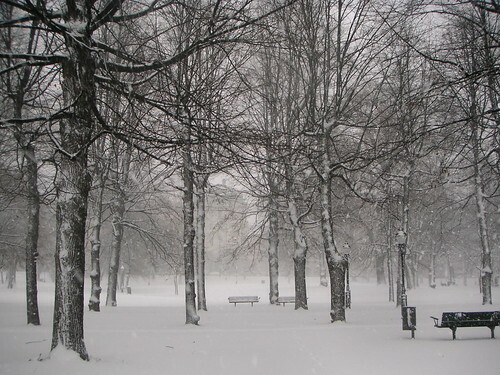 we’ve had a lot of snow these past couple of days and i think it’s wonderful! 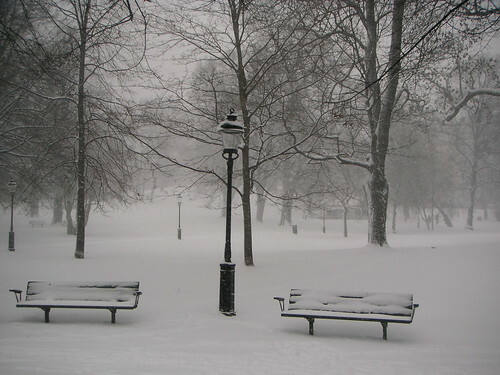 i love snow! we drink glögg, listen to my dean martin and frank sinatra christmas albums and watch christmas movies (it’s a wonderful life, die hard, the apartment and other christmas classics) and i knit, of course. i’ve finished another mitten, but my photos turned out really bad. but i really wanted to show you a picture of it today, so you’ll have to forgive this one, a crappy flash photo. i’ve knit about half of the second mitten and i’m a bit worried that i’ll run out of blue yarn. i went for a walk in humlegården, a park in the middle of stockholm, during lunch and took quite a few photos. here’s a few of them. i was just about to fold some laundrey when i happened to look out the bedroom window. i couldn’t believe my eyes! 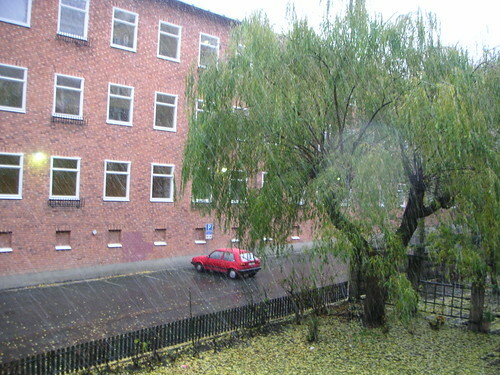 it was actually snowing! 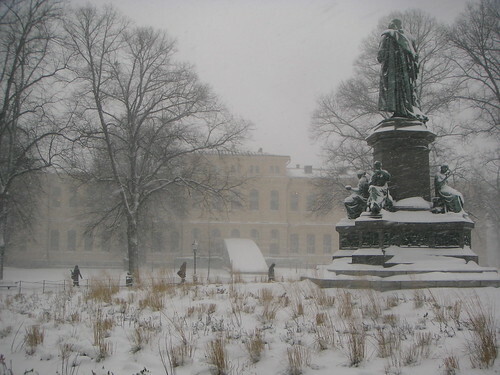 i’ve been longing for snow for weeks now, and i had not expected it today. we had over +10 degrees here yesterday, and i’d looked at the thermometer just an hour or so before it started snowing and was still about +5 degrees out then. i rushed for my camery and stepped out on the balcony to try take some photos. 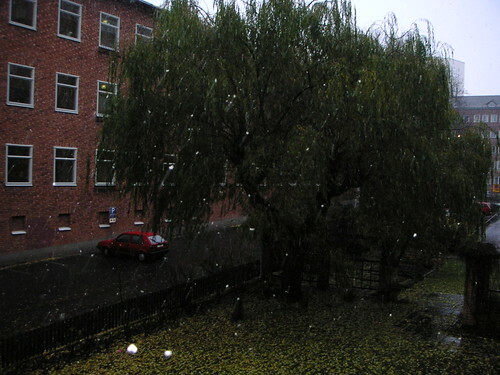 well it’s a bit hard to take good pictures of falling snow, and these photos do not to the flakes justice at all, but you must believe me when i tell you that we had really big, fat christmas flakes! well, it melted as soon as it touched ground, but i’m happy anyway. 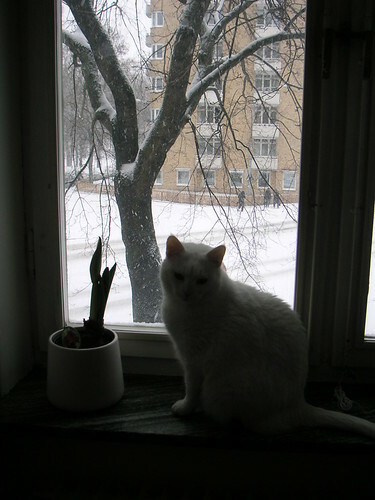 it was the first snow. 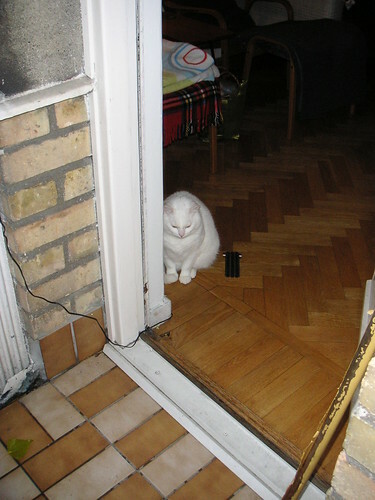 anyway, what i really intended this post to be about was: mittens. for those of you who know me (from reading my blog or in real life) probably also know that i’m almost a bit obsessed with mittens. i haven’t knit that many pairs (yet) but i collect mitten patterns and think about mittens a lot. i’m not joking, i mean a lot. 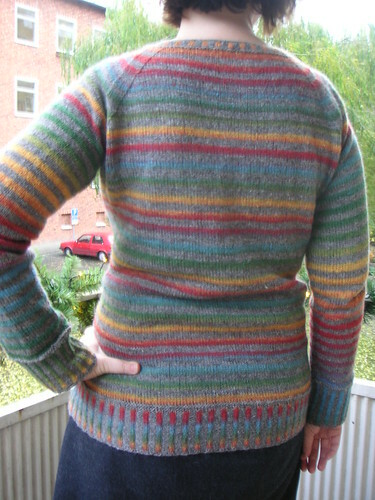 well, as my recently finished jumper progressed it was increasingly difficult to do some seroius knitting on it on the bus to and from work (just imagine: “excuse me, people, when i try on this not yet finished jumper to see if it fits and if i need to work another centimetre on the neckline!” i don’t think so.) so, i needed a new bus knitting project and what can be more perfect than mittens? i’ve already finished the first mitten in a new pair, the pattern in called fisherman’s mittens (ravelry link) from and i’ve used that book knitting fair isle mittens and gloves twice before as you may remember. i’m using some drops alpaca that was already in my stash. unfortunately, i’ve almost run out of the light green yarn, so i need to take another trip to marias garn to buy some more. 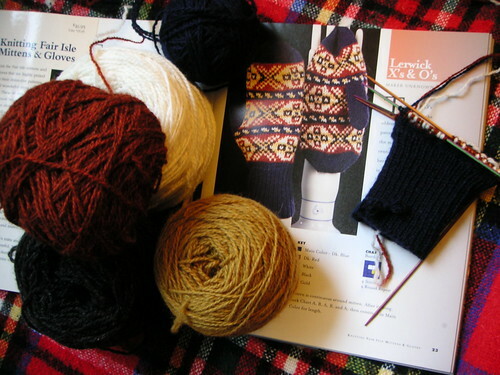 in the meantime, i’ve cast on for another pair, lerwick x’s & o’s (ravelry link) from the same book. 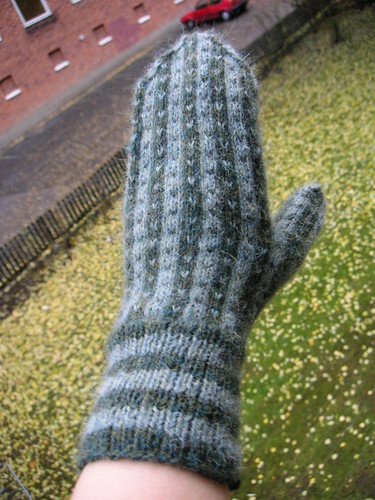 i will of course add thumb gussets, since those are not existing in the pattern, and i don’t like mittens without thumb gussets (or wedges if you prefer that term). i’m also using stash yarn for these, the red and yellow are left over from my two previous mittens mentioned above, the dark blue is some morjärv 2-ply wool that satoko gave me once, the white is left over from my knitting course at hv-skolan and i think it’s kampes? also 2-ply wool. the very-dark-grey-almost-black yarn is wool but i can’t for the life of me remember what it is or where i got it from. judging by how it’s wound, it’s probably from satoko too. i’ve finished my time team inspired jumper! i’m very pleased with it, it’s very warm and soft. i think i’ll wear it a lot this winter! i call the jumper “aston” as a tribute to time team’s mick aston who often wears colourful striped jumpers in the programme. 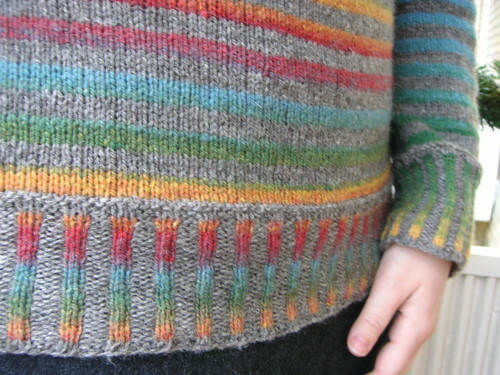 the jumper is knitted from the bottom up on circular needles. sleeves are also knit from bottom up but on double pointed needles. 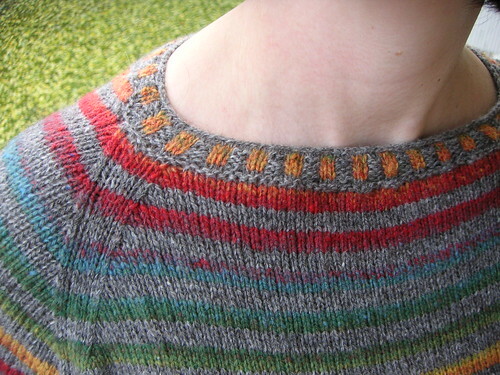 when i’d knitted up to under the arms on all pieces, i joined on circulars and knitted up the yoke to the neck. i added some length in the back of the neck to achieve a better fit. this was done by consulting elizabeth zimmerman’s knitting without tears. 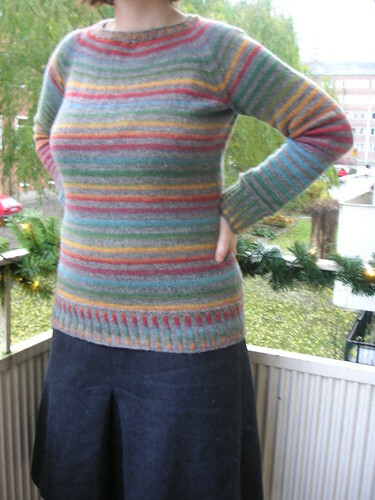 i didn’t follow a pattern otherwise, i measured one of my favourite jumpers and used those measurements as my pattern. since two-colour ribbing is much firmer than a normal rib, i used 4 mm needles for the ribb at the hem and cuffs, and 3,5 mm for the neck ribbing. 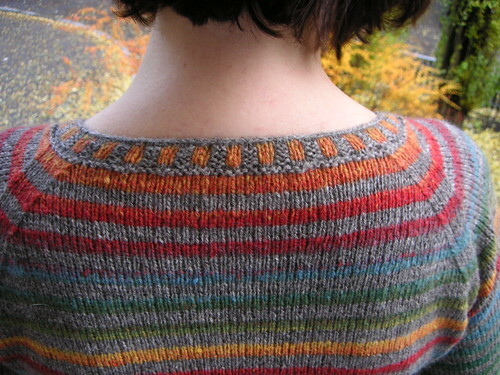 the body and yoke is knitted with 2,5 circulars and the sleeves on 3 mm dpns. the reasons for the discrepancy in needle size between body and sleeves is simply because my “circular” gauge differs a lot from my “dpn” gauge. the photos aren’t great, but it’s been very hard to take photos lately, since there’s often not enough daylight, even at noon. it’s very gray and dark out. but i’m not complaining. i like this weather. well, now i’ll get on with some mitten knitting, i’ll show you more of that tomorrow. i have a rather bad cold at the moment, so i’m going to snuggle up in my favourite chair with my knitting, some ben & jerry and gone with the wind on tcm! 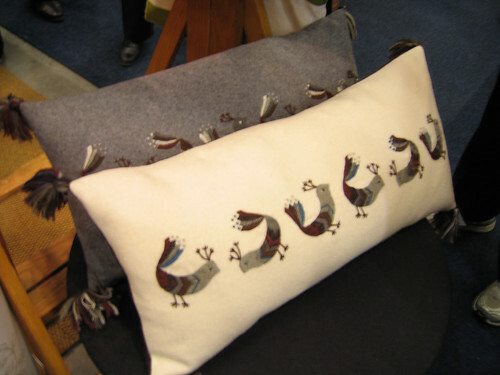 i forgot to bring my camera to the craft fair, but i borrowed carin’s. she has uploaded some of the photos on her flickr account, and i’ve shamelessly stolen then so i can show you some photos of the actual event. enjoy! 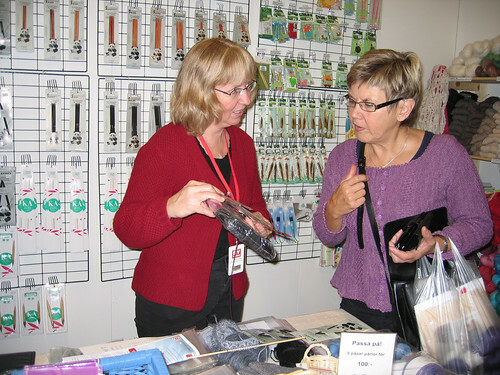 twice every year there is an indoor fair in the stockholm area called syfestivalen (literal translation is actually “the sewing festival”) where one may shop all kinds of things within the textile crafts. i haven’t been to one in many years, mostly because i’ve been a bit dissapointed at what’s been availble (too much acrylic and too much quilting and scrapbook making for my taste). 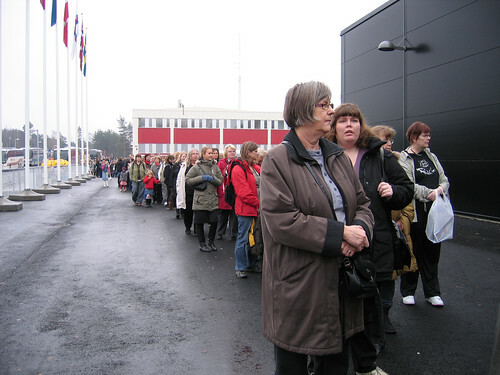 but this time, they’d moved it to a new venue, and i thought i could give it another chance. well, i did find some really nice things there, but the best part was meeting up with my friends (both old and new!). 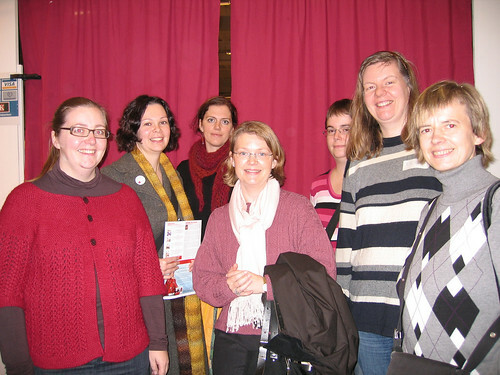 i arranged, together with some ravelry friends, a small informal ravelry meetup. 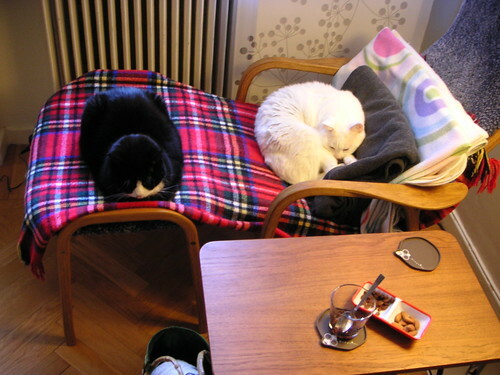 no, i do not intend to start quilting, but i have some sewing plans that i will tell you about later. 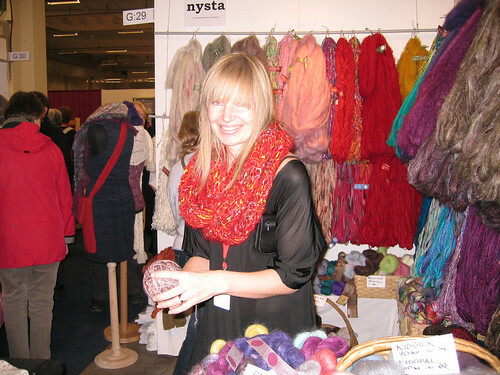 all in all, it was a nice outing, but i really wish we had some sort of fiber festival here in sweden where yarn shops and spinning mills would get together for a fair and perhaps organise some workshops and other fiber related activities. i suppose syfestivalen is as close to it as we get at the moment. 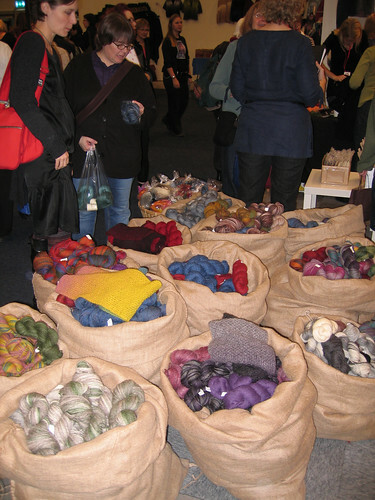 at least they had a “knitting square” where many yarn shops had their booths and in the middle of the square there were large tables where you could join a small knitting or crochet related workshop.